plays: cinematique ambient, trip storytelling, cyborg jazz, insect big beat, horror dub, industrial highway tech hop, dark future neon blues, cyber delic electro punk, urban chill out or just numbers to listen! Back in the very hot summer of 2003, Tobias Krämer a.k.a. Tomahawk suggested to occupy a garbaged cellar room at the alternative artist`s working- and living community Fabrik_Worms. His idea was to relocate there a band`s room. Alexander Seewald a.k.a. Doc. AtmosfearCrush, former member of [analogwerk] insisted on to establish there a whole project studio instead. The both guys mixed their ideas and forces and in September 2003 the [Esc.] Laboratory booted up its system by the help of some friends. While Tomahawk`s background as a classic guitarist, songwriter and lead singer led him to explore new ways of working with music, Doc. AtmosfearCrush came from the more straightful side of electro / techno as well as experimental sound design. During the winter of 2003 Marco Müller a. k.a. Machete, former member of Berlin`s Projekt Klangform joined the base of creativity.With his background of electro / techno and his love also to experimentate with the expressions of sound compiled the triangle of the monster motor machine. Shortly after, Harry Seifert a. k. a. Harlequin also took advantage and joined the [Esc.]Laboratory. His ambitions as a dark ambient comic artist, guitarist, lead singer and beat monster fed perfectly in full context. Since 2003 the LAB-crew got used to perform at clubs, parties, festivals and art exhibitions exclusively to proof their live capability from experimental improvisations to vibeful techno live acts. While celebrating an own kind of studio happenings a lot of people got in touch with the LAB-crew and joined from time to time the jam sessions. Then in the summer time of 2005 another member joined the ride. With the engagement of Steffen a. k. a. Dienschda 380 as bass player new horizonts opened. After some tragic mysterious hard-disk crashes, which completly earased the whole [Esc. ]Laboratory sample and sound library, things nearly drove everyone of us more avantgarde than we used to be. This was the kicking idea of the studio`s own philosophy. Every track is a recorded moment in our lives! It`s a jaming monster of sound and rhythm, dark and lurking hungry. The strategies got more minimalistic and both worlds, the side of studio producing and the side of live performances morphed in to each other. [Esc. 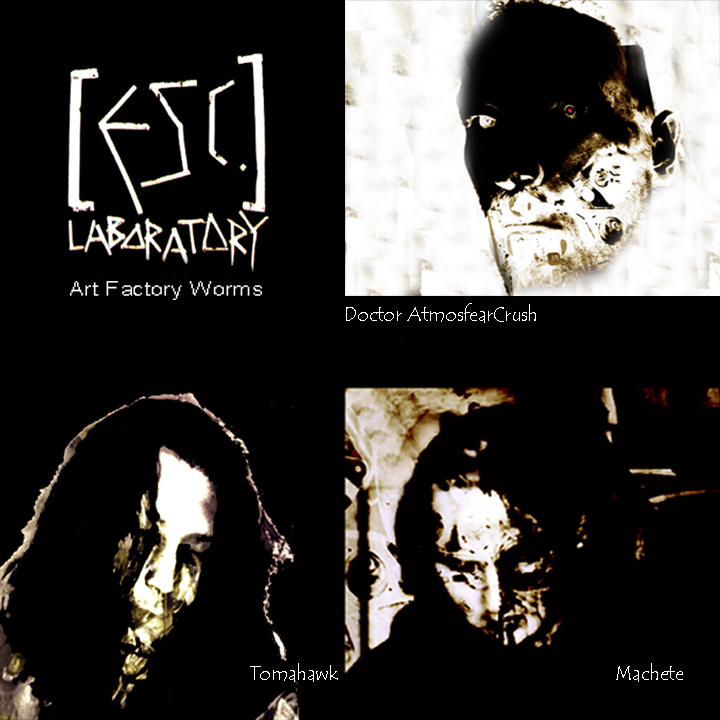 ]Laboratory`s own interpretation of how contemporary music should sound.